A “Series I” version…very smooth. Used? Yes, but apparently very lightly used – I had whipped out the Surefire in the store and scoped out the barrel and inside the mag-well and breech, etc. Some wear (rather, a slight discoloration of the frame where a hand gripped it) and for the rest it was nice and shiny and new-looking. I’d say 98%…no less than 95%. A little powder sludge at the top of the firing pin stop and on the breech face which wiped right off. N-i-ice trigger. Much better than I’m used to on the 1991A1. The Custom Shop brochure in the box was dated 1999. From a rest, slow-fire, it was probably insulted at my marksmanship ability. Nevertheless, the rounds were in the 8-ring at 25 yards (remember, I haven’t fired in a year). Using an unbraced Weaver hold and standing there I got reasonable “social work” accuracy out to about 15 yards in slow-fire mode but predictably worse if practicing “hammers” or “controlled pairs.” No insurmountable problems and significantly better than my 1991A1 which I used to create a baseline for comparison. The lighter, smoother trigger was most of the advantage in my opinion. 1. The tritium is either going or it wasn’t much to begin with since you can’t see it at night unless you hold the pistol almost up to your nose. The rear dots are easily visible. Perhaps too visible. 2. The front sight dot is harder to pick up than the dots on the rear sight in daylight and forget at night. I’m very happy, so far. At the 10-yard line I moved outside the A zone a bit, but that is the shooter, not the gun and let’s not mention the 25-yard line (I tried braced kneeling but my hold was wobbly) and let us just say that I was on the paper much more than I would have been with the Colt 1991 I’ve been carrying and using for years. Nothing that can’t be fixed with some serious practice. Now, being a dedicated Cooper-ite I wanted to make the following changes: 1) replace the ambi thumb safety with a strong-side only thumb safety; 2) replace the long trigger with a short trigger but keep the 3.5-4# break; 3) put on some slimline grips; 4) remove the extended magwell and either replace the mainspring housing or put a set-screw in it to protect the magwell threads (just in case); and 5) do something about that front sight. Sobbing… when I got home from the match, I unholstered the pistol so I could clear it and clean it. The nice, pretty 30-lpi frontstrap checkering was “red” where it had touched my shirt. (Note: my 1991A1 has never done this in almost eight years of similar use.) So…liberal application of BreakFree and toothbrush cleaned it right up. Used up some Surefire battery time inspecting the pistol for any other places where it might need attention and found none. Okay, we’ll get sweaty and see what happens – one day and no problems, second day and a hint of color shows up – so I’d have to wipe it down daily with BreakFree where I had been dry-wiping the Colt and using BreakFree as little as once a week under similar circumstances, at least wiping condensation and sweat off at the end of the day with cloth where the Kimber tempted me to leave it oozing with BreakFree (well, maybe not “oozing” but …). Hmmmm. Replace safety, trigger, grips, front sight; remove magwell, hard chrome … Hey, this isn’t such a deal anymore! I could probably upgrade the 1991A1 to what I want for less than the Kimber cost already. And hard chroming would probably require some tweaks and break-in to account for the accretion layer of chrome (I guess). Hmmm…. Okay, that was the straw that broke the proverbial camel’s back… the Kimber is out of here. I don’t buy “stainless” merely to keep on performing “blued carbon steel” preventive maintenance. I’m spoiled by the 1991A1’s forgiving nature and just don’t want to deal with a need to do a close inspection and scrubdown if I miss a day or just get outside of my normal A/C environment and sweat it up. After 30 minutes on the treadmill I can touch it and see it discolor – and for that matter my Defender and AMT DAO Backup have even been on the treadmill with me – something I’d never consider now with the Kimber. 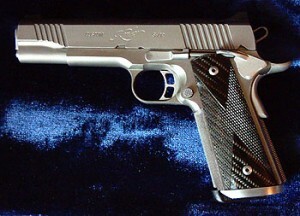 Love the Kimber Gold Combat Stainless – always will – hate the steel they used. If you aren’t overweight and a sweat-a-holic, and/or carry in other than an IWB rig you’ll probably love it too. Tom Givens is giving a class next month and that should help me get my marksmanship headed back in the right direction. As for the equipment, adapt and overcome with the 1991A1…. [Editor’s Note] I got a lot of e-mail about this article and the issue of corrosion on stainless steel. A number of readers pointed out that they had suffered corrosion on stainless Colts and Springfield Armory pistols. I have carried a stainless and alloy Kimber Pro Carry for quite some time and I have never suffered any problems with staining or corrosion and I have carried it in very sweaty, humid situations. My son, on the other hand, can just look at metal and cause it to corrode. He actually stains chrome plated Craftsman wrenches when he works with them. He raised rust spots on my Remington 870 with that flat black whatever-it-is finish they’re using these days, and it’s tough. On a recent camping trip, I opened a package of MRE fruit with my Benchmade Ares and its 154CM stainless blade, and it left a nasty blue stain across the blade. We all have different body chemistry and there is really no such thing as truly “stainless steel.” All “stainless” has a certain amount of carbon in it and there will always be some combination of chemistry and conditions that can stain or corrode it. I guess the moral of the story is to treat “stainless steel” as if it weren’t and coat it with a corrosion resisting oil like Mil-Comm.